Structures & Opportunities Event Held on January 18th. 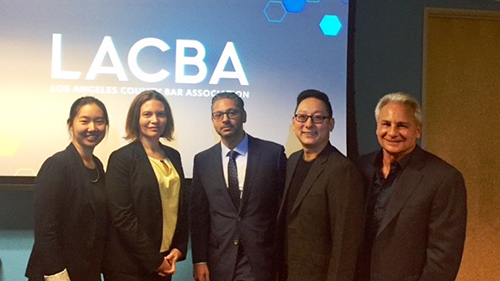 Our Real Estate Finance subsection CLE panel discussion, Real Estate Marketplace Lending: Structures & Opportunities, moderated by Herman Enayati of Akerman LLP, was a huge success. The evening concluded with a post panel networking opportunity and refreshing cocktails. This year's Annual Update portion of the program will be presented by the Construction Law Group from Sheppard Mullin Richter & Hampton. The program will cover new developments in California Construction Law in 2016. The handout materials from this program should be considered a "must have" for anyone who practices in the construction law area. This program will cover important cases decided by California courts and the U.S. Supreme Court in 2016 that impact the practice of real estate law in California. This program is designed to give a quick overview of important developments in the law that affect California real estate practitioners. A basic discussion on guaranties. This program, which will benefit practitioners of all experience levels, will provide in-depth insight into Covenants, conditions, and restrictions (“CC&Rs”) for a shopping center. Recent cases dealing with this subject matter will also be reviewed. Stipulated judgments requiring city to set aside various percentages of its Community Redevelopment Law "tax increment" for low- and moderate-income housing projects were enforceable obligations for purposes of legislation dissolving community redevelopment agencies, but the judgments had no force or effect once the dissolution legislation took effect. There were no remaining terms to be fulfilled under the stipulated judgments once the legislation became effective. The legislation eliminated the tax increment that provided the only source of funding subject to the stipulated judgment. Nothing in the judgments required the tax increment to continue to be collected, or purported to prevent the Legislature from recapturing unspent tax increment funds by subsequent legislation. The moneys set aside under the judgments, but unencumbered, had to be remitted to the county auditor-controller as per the subsequent legislation. Trial court erred in staying construction defects action pursuant to the Right to Repair Act, where defendant failed to comply with the act's strict time limits for acknowledging receipt of the homeowner's notice of a claim. The act's goal of promptly resolving claims without resort to litigation cannot be achieved by permitting homebuilders to serve tardy responses to claims or to ignore them entirely. Claims that the EPA failed to comply with requirements of Sec. 7 of the Endangered Species Act regarding consultation with other agencies when it issued various "reregistration eligibility decisions" under the Federal Insecticide, Fungicide and Rodenticide Act were either time-barred or jurisdictionally barred. Where it is alleged that an agency failed to comply with the ESA's procedural requirements, the general six-year statute of limitations period, set forth in 28 U.S.C. Sec. 2401(a), applies, and a Sec. 7 claim raised after the EPA undertook public notice and comment must comply with the jurisdictional provisions of FIFRA, and a plaintiff must file a petition for review in the court of appeals within 60 days of the entry of the contested final order. EPA's approval of individual pesticide products constituted agency action for Sec. 7 purposes, and claims that EPA violated Sec. 7 with respect to such approvals were not barred by the collateral order doctrine. Statute permitting the Federal National Mortgage Association "to sue and to be sued...in any court of competent jurisdiction, State or Federal" does not grant federal courts jurisdiction over all cases involving Fannie Mae, but merely allows Fannie Mae to sue and to be sued in any court that already has jurisdiction over the subject matter. Physical possession of a mortgage note is not a prerequisite to foreclosure. Foreclosed-upon homeowners lacked standing to contend that an assignment of their mortgage to a New York securitized trust was void, because the trust had closed prior to the assignment. Under New York law, an untimely assignment to a securitized trust made after the trust's closing date is merely voidable. Assumption that an employee who "robo-signed" declaration setting forth mortgage arrears had not read the document or that someone else signed on his behalf did not undermine the validity of the foreclosure where there was no dispute as to material facts, such as the amount owed or that their loan was in default. Plaintiff, who gave a mortgage to a lender who became insolvent, and whose assets were purchased by defendant, failed to state a cause of action for violation of the "dual tracking" prohibition of the Homeowners Bill of Rights. Plaintiff acknowledged on the face of the complaint that he did not accept a loan modification within 14 days of its being offered. Plaintiff failed to state a claim based on defendant's alleged lack of standing to foreclose, or its alleged illegal substitution of a trustee, where it was beyond reasonable dispute that defendant succeeded to the rights of the original lender. Plaintiff, who suffered final judgment in a prior wrongful foreclosure action, was barred by res judicata from bringing new actions based on alternative theories of wrongful foreclosure. Where housing authority ceased making Section 8 payments on tenant's behalf due to landlord's failure to maintain the property in a habitable condition, landlord was not permitted by law to recover the unpaid amounts from tenant or to declare her to be in breach of the lease when she failed to make the full payments. Tenant’s waiver of all rights under local rent control ordinance was valid and enforceable where tenant agreed to, and did, accept a lump sum payment in exchange for the waiver.